What happened to IS democracy? 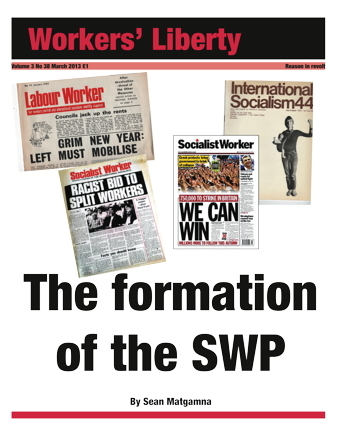 This pamphlet covers the pre-history of the SWP in the Socialist Review and IS groups of the 1950s and 1960s, and the period between 1968 and the late 1970s in which the essentials of today's SWP were formed. Written by one of the very few members of the IS National Committee of 1968-71 still active, it dispels myths and identifies some of the deep-set roots of the SWP's current troubles. “Standing resolutely on the side of the proletariat, the socialists do everything in their power to facilitate and hasten its victory. But what exactly can they do in this case? “A necessary condition for the victory of the proletariat is its recognition of its own position, its relations with its exploiters, its historic role and its socio-political tasks. IS grew in the mid and late 1960s as a very amorphous revolutionary tendency. Its main paper in the early 1960s, Young Guard, was more anarchistic than anything else. But the group which had dominated the revolutionary left for the previous period, Gerry Healy’s SLL, obliged the IS by becoming increasingly mad and suicidally sectarian, for example boycotting the big demonstrations against the Vietnam war in the late 60s. In the early and mid 60s, one of IS’s dogmas was the belief that imperialism had ended. Michael Kidron wrote an article in 1962 with a smart-alec title, “Imperialism, highest stage but one”, referring to Lenin’s pamphlet, “Imperialism, the highest stage of capitalism”. There were still colonial wars going on, and would be, in Portuguese Africa for example, until the mid-1970s; but in essence it was true that the old colonial imperialism was vanishing. The history of the British Trotskyist movement has largely been written from the viewpoint of the majority of the RCP (the main Trotskyist group in the 1940s). There is a myth of a golden age of the RCP. But it is a myth. The RCP collapsed in 1949. Its central leader, Jock Haston, quickly evolved to the right, and was involved in the right wing of the ETU for much of its subsequent life. Solidarity and Workers’ Liberty are Trotskyist. But we have argued that “orthodox Trotskyism” from the 1940s became warped by traits and syndromes alien to the spirit, though sometimes not to the letter, of the ideas of Trotsky and the Bolshevik rearguard. More light and instruction can be found in the tradition of the “Third Camp” Trotskyists such as Max Shachtman and Hal Draper. The Trotskyist Tendency came from Workers' Fight, forerunner of AWL, a small group perhaps ten strong when it merged with IS in December 1968. We merged on the basis that we could continue to argue inside the group for what we considered to be authentic Trotskyism while cooperating in practical work. In a nutshell, the story of IS's transformation and the emergence of the neo-Healyite SWP out of it is the story of how a very loose group, with a family cult at the centre, grew, centralised itself, and developed a "machine" with the once seemingly benign cult figure in control. Here there is a danger of scapegoating Cliff and presenting a Bad King Cliff account of the history. Cliff was only part of it.